The Funeral of Dr. Karunatilaka Amunugama, former Ambassador of Sri Lanka to Germany, was held at the Borella (Kanatte) Cemetery, Colombo in the afternoon of Friday December 15, 2017. The remains of Dr. Amunugama were cremated in the presence of a distinguished gathering comprising high ranking retired diplomats, senior officials of a number of Government Departments, including the Attorney –General’s Dept., officials of the Ministry of External Affairs, and close relatives and friends. Former Ambassador Karunatilaka Amunugama was a veteran of the Sri Lankan Foreign Service. He had served widely in Asia, and had worked as Second Secretary in Cairo, Counselor to the Sri Lanka High Commission in Singapore, and as Ambassador to Thailand and Japan before proceeding to China. His last diplomatic appointment was as Sri Lanka’s Ambassador to Germany (from August 2014 to September 2017). He also served for some time as the Secretary to the Ministry of External Affairs. A graduate of the University of Sri Jayawardenapura in Sri Lanka, he went on to complete a postgraduate program in Manpower Planning at Victoria University in the United Kingdom in 1982. He was an old boy of St. Thomas College, Matale. Mr. Bernard Goonatilake, a senior diplomat and former Secretary to the Ministry for External Affairs, delivered a brief funeral oration. 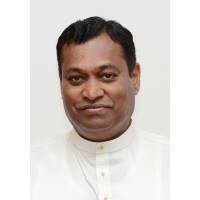 He said that the sudden demise of ‘ Thilak’ within three months of his return from Germany as Sri Lanka’s Ambassador, had prevented many from being able to meet the late Dr. Amunugama and to discuss and share their experiences with each other. Dr. Amunugama had acquired wide experience as a diplomat having served in several Capital cities of Asia and finally a stint in Berlin, Germany. He was highly respected for his capacity to think outside the box. Whatever challenges he undertook to meet, he did it with great determination and tenacity, and thereby winning the admiration of his colleagues and staff at the Ministry of External Affairs. A younger brother of the late Dr. Amunugama spoke on behalf of his relatives. Referring to his departed elder brother as ‘ Podi Aiya’, he said that the mourners had included the current President of Sri Lanka, Hon. Maithripala Sirisena, former President Hon. Mahinda Rajapakse, and the Prime Minster Hon. Ranil Wickramasinghe, all of whom had visited the funeral parlour to pay their respects. Senior diplomats from the Embassies of Japan, China and Germany had also visited the funeral parlour in addition to a large number of people from various backgrounds who had been associated with the late Mr. Amunugama in the past. He thanked the medical doctors and staff of the Asiri Hospital, as well as the oncologists and nursing staff of the Apeksha (Hope) Cancer Hospital at Maharagama, for their kind services. Among the crowd gathered at the funeral were Mr. S.B. Atugoda (former Sri Lanka Ambassador to Germany) and Mr. Nihal Rodrigo ( a retired senior Diplomat). “I had the privilege of serving as Ambassador during his tenure as Secretary of the Min. of External Affairs. He was an absolute gentleman and indeed an extremely capable career diplomat that our Motherland ever produced. He was the epitome of what a patriotic Sinhala Buddhist State Officer should be. Oh! What a sad loss to us and our Motherland! During his period of service as Sri Lanka’s Ambassador to Germany ( 2014 – 2017) he was a constant visitor to Das Buddhistische Haus (Berlin Vihara) in Germany, with members of his family and staff, and they extended their fullest support and patronage under his guidance to the Buddhist religious activities being conducted at the Berlin Vihara. The Management of Das Buddhistische Haus and Buddhist monks knew him personally and were deeply appreciative of his abiding interest in the well being and sustenance of the Berlin Vihara and the strengthening of Buddhist cultural links between Sri Lanka and Germany, among other notable contributions. This entry was posted on Saturday, December 16th, 2017. You can follow any responses to this entry through the RSS 2.0 feed. You can skip to the end and leave a response.